Annuals are a flexible addition to your garden. Unlike perennials, annuals are flowers that only bloom once. They experience their full life-cycle from seed to death all in the span of one year. This makes the annual flower a unique addition to any garden, so today we’re going to give you a brief overview of how these flowers work and how you can utilize them this year. Ready to get started? Let’s get planting! What sets annuals apart from other floral types? The biggest difference for annuals is the fact that they live out their entire growth-cycle in one year. Though this can deter some from utilizing these wonderful flowers, their short lifespan can actually be an asset. For example, if you wanted to create themed garden plans each year, you would be able to pull this off using annuals, rather than having to transplant or remove perennials. You could also use annual plants as experimental color accents for your garden. Despite the fact that they have a short life cycle, their blooms are vibrant and full of vitality. Sunflowers are a great way to test the waters with annuals. 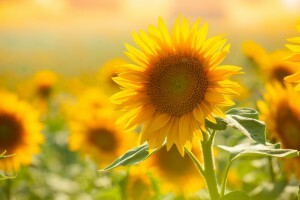 Sunflowers make a beautiful addition to any landscaping feature, but they are also great flowers for beginners. Due to their hardy nature, they can thrive in almost any soil as long as it is not waterlogged. What they do need is a lot of sun, but you may have guessed that because of their name. They are sunflowers after all. You may also note that wildlife like squirrels and birds enjoy sunflower seeds just as much as people do, so keep that in mind once they bloom. This entry was posted on Monday, April 24th, 2017 at 10:48 am. Both comments and pings are currently closed.